The Scout Mobile App for Pet Owners is a Mobile App for customers who's pet sitting company uses Scout to manage their dog walking business. Upon signing up with your pet sitting company, you will receive an account activation email (check your inbox and spam folder for this email). Open this email and follow the link to activate your account. The link will take you to a page to set up your password. 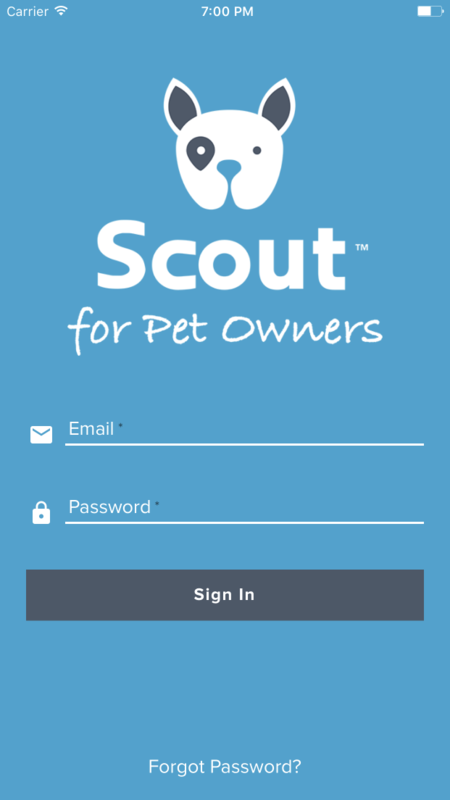 Once you set a password, you are then provided the download options for Scout's Mobile App for Pet Owners. Once you download the app, enter your user name and password. If your pet sitting company requires an electronic payment method, you will be required to enter it before continuing to use the app. To enter a payment method, select "Payment" from the side bar menu. Based on your pet sitting company's payment settings, you will be provided a list of acceptable electronic payment methods. If your pet sitting company has not already done so, you will need to create a pet profile before requesting an appointment. Open the menu on the top left of the app and select "Pets" from the menu. Click the plus sign in the bottom right of the Pets menu to add a pet. Enter all of the required and relevant fields and save click save.